In a previous blog (http://yourdailyshakespeare.com/shakespeare-murder-sarajevo/equalities), we examined the Austrian characters of the Sarajevo tragedy. Here we will touch on the Serbians who plotted the assassination of the heir to the Austro-Hungarian throne, Archduke Franz Ferdinand – the official trigger of WW1. There were actually seven terrorists in town on the day of the murder, and here the ‘terrorist’ appellation is justified. Five of them did nothing, one, Nedjelko Chabrinovitch, threw a bomb at the Archduke causing little damage and one, Gavrilov Princip, fired the killing shots at the Archduke and his wife Sophie. Of the seven, six were caught. The seventh, a Bosnian Muslim called Mehmed-Bashitch, fled to Montenegro. Later in the year, at the time of the trial, Austria requested the government of Montenegro to arrest Mehmed-Bashitch and extradite him to Bosnia. Which Montenegro did not want to do – therefore they arrested him but allowed him to escape. 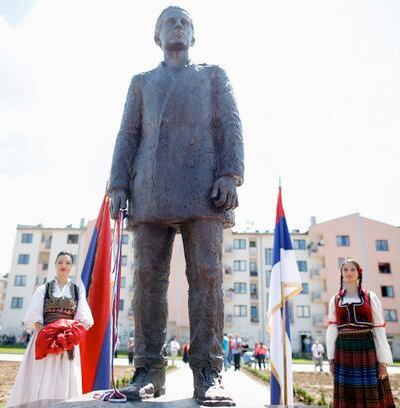 It is telling that, on this very June 2014, the Bosnian Serbs erected a monument to Princip, on the spot where he committed the murder (see image), while on the other side of the city, the Vienna Philharmonic Orchestra gave a concert. Said the conductor, “We feel obliged to do things in a better way than it was done in the past”. Which should elicit bursts of bitter laughter from those who consider the current entangled European imbroglio, strategically commanded and directed by the “exceptional country”. Sarajevo’s seven foot-soldiers were the young men who, in every age, listen with credulity to the whispers of fancy, and pursue with eagerness the phantoms of hope. Scores of eminent historians have examined the causes of WW1. No need then to retell a tale of woe. However, a minimal historical context is necessary to outline the main ideological issues at play. In a previous blog (http://yourdailyshakespeare.com/shakespeare-french-revolution-world-war-one/equalities), we have seen how the sentiment of nationality developed in Europe, under the influence of the Napoleonic ventures. During the XIXth century, Serbia managed to extricate herself from the Ottoman empire, not without spilling abundant blood in various wars with the Turks. In 1867 Serbia became de facto independent and in 1876 it declared its unification with Bosnia. But two years later, at the International Congress of Berlin in 1878, Bosnia was re-assigned to the Austro-Hungarian Empire. Conditions in Serbia mirrored Italy’s. Italy became a nation in 1861 under the royal house of Savoy, which formerly only ruled over the region of Piedmont, a kingdom that had been independent since the early Middle Ages. Piedmont became the pivot that unified the Italian states into one country. Serbia was to the Balcans what Piedmont was to Italy. Meaning that Serbia’s aimed at creating a “Greater Serbia” in the Balcans, by unifying the Southern-Slaves, that is, the Yugoslavians. In fact one newspaper of the times, printed in Belgrade, was aptly called “Piedmont”. The parallel between Serbia and Italy is close. When Italy became a state, only 3% of the population spoke Italian and, after the official nationalistic enthusiasm died off, the difficulties involved in amalgamating at least 20 different ethnic groups and languages proved enormous. In Serbia, the ethnic groups had coalesced into various independent countries, often conflicting with each other, notwithstanding a nominal Slavic root. Prior to the assassination, there existed in Serbia two organizations, which today we would Orwellianly call NGOs (Non Government Organizations). One was the “Narodna Obrana” (National Defense), whose objective was to raise and strengthen the feelings of Serbian nationalism, to enroll volunteers and to gather funds for military actions as needed. Of course the stated objectives of Narodna Obrana were “purely cultural”. Today it would probably be called “Endowment for Democracy”. The other NGO was the “Ujedinjenie ili Smrt”, more easily uttered and known as the “Black Hand”, a revolutionary society even more ominous than Narodna Obrana. Its operations were shrouded in secrecy and it included a clique of miitary officers. Together, the two organizations controlled the Serbian media and could cause a government to collapse if it did not display sufficiently nationalistic and belligerent attitudes towards the outside world. Austria was not the only enemy. There had been a war with Bulgaria in which Serbia gained some territory. In fact the “Piedmont” newspaper was printed by the “Black Hand”. The leader of the movement was the Chief of the CIA of the Serbian Military, Dragutin Dimitrijevith, correctly described as a professional anarchist and assassin. In 1903 he organized the assassination of King Alexander of Serbia. Earlier in 1914 he organized the murder of King Ferdinand of Bulgaria. In 1916 he dispatched someone from Corfu to murder King Constantine of Greece. Finally in 1917 he was condemned to death for allegedly dealing with the enemy and attempting to assassinate the heir to the Serbian throne. More likely, according to some historians, to prevent him from giving evidence of the Serbian Government’s involvement in the assassination at Sarajevo. Both Chabrinovitch, who threw the bomb, and Princip who fired the deadly shots, had left school early but did not find a steady job. They drifted to Belgrade where they quickly absorbed the anarchist and terrorist propaganda – along with the notion of Austria’s oppression and of Serbia’s role as the “Piedmont” of the Balcans, which would liberate the Bosnian Serbs and help create the “greater Serbia”. Both suffered from ill health due to malnutrition and tuberculosis and both died in prison, Chabrinovitch in 1916 and Princip in 1918. Incidentally, they were not condemned to death, as they both were barely under 20 years of age at the time of the assassination. In this 1914’s Austria was ahead of XXI century’s USA – where 22 people aged between 16 and 17 have been executed since 1973, assuming the online related data correct. Bombs, revolvers and ammunitions were smuggled from Belgrade with the connivance of the Serbian frontier guards, and reached Sarajevo below the hay of a donkey cart. Next, they stopped at the Town Hall, where the Archduke’s wife met a deputation of Islamic women and the Archduke received various officials. The Mayor started its prepared speech praising the loyalty of the Bosnian people. Franz Ferdinand interrupted him, “Enough of that. I make you a visit and you receive me with bombs.” But the Mayor finished his speech. The following step in the program was the visit to a Museum. Prudently, it was decided not to follow the pre-arranged route that included a narrow street, but to drive more quickly through a wider avenue. But the driver of the Mayor’s car turned by mistake into the narrow street, which caused the motorcade to stop and correct the course. Princip was waiting at the corner right where the Archduke car stopped. The rest we know. Reflecting on the ideas that guided the assassins, we may note that since the dawn of historical times, all political and social institutions have been founded on religious beliefs. The gods have always been protagonists on the world’s stage, as only religious beliefs can rapidly influence character. Nationalism is the twin, or rather, the Siamese brother of religion. The Arab conquests, the Crusades, Spain under the Inquisition, England during the Puritan period, France with its St. Bartholomew’s slaughter are all evidence of peoples made fanatic by chimeras. The chimeras exercise a permanent hypnotic effect, so radical as to intensely transform their holder’s entire mental constitution. It is true that man created the gods, but after creating them he quickly became their slave. Lucretius held that the gods are the offspring of fear. But it is not true, they are the offspring of hope. What the gods gave man is the possibility of a state of mind that induces a kind of happiness. Behind the nationalistic dreams and ideas is the engendering of a mood that makes their holders feel good about themselves. On the other hand, ideas, such as nationalism, only affect the soul of people when, through slow elaboration, they have descended from the airy regions of thought to the stable and unconscious domain of the feelings, from which our motives of action spring. Ideas then become elements of the character and will influence conduct –character, as we know, being formed in part by a stratification of unconscious ideas. After undergoing a slow elaboration their power is considerable, because reason ceases to have any hold on them. The Princip and Chabrinovitch of this world, when intoxicated by an idea, religious or in their case nationalistic, are inaccessible to reasoning, however intelligent they may be. All they may attempt, by artifices of thought and deformation, is to bring any idea that seemingly contradicts the conceptions that dominate their mind, into some sort of agreement. In modern times and more so today, nationalism has conjoined with the even more regressive cult of neo-liberal economics, to promote the idea of the “exceptional state” – a powerful myth enabling the oppression and the murder of millions for “humanitarian” reasons. A clear example of the artifices and deformations of thought required to overcome inherent contradictions. And, along with the cult of neo-liberal economics, the grotesque enrichment of the transnational pimps, knaves and lechers who profit from murdering people and destroying the planet. Some may argue that we cannot compare Serbia’s nationalism of 1914 with America’s “exceptional” nationalism of 2014. On the other hand, in the most important part of its business, history is but an imaginative guess at the most likely generalizations. This entry was posted in Best Shakespeare Quotes, Elegant Shakespearean Quotes, Historical Quotes, Philosophical, Psychological & Historical Considerations, Shakespeare and Politics, Shakespeare in Management, Shakespeare in Politics, Shakespeare Invocations and tagged best shakespeare quotes, effective communications, king richard III, Shakespeare in Management, shakespeare talk. Bookmark the permalink.